Hi there! Today’s post is about my current beauty favourites. As always, I’ve picked my top 3 and a few honourable mentions from all the products I reviewed this month. And these are the products that I liked best! 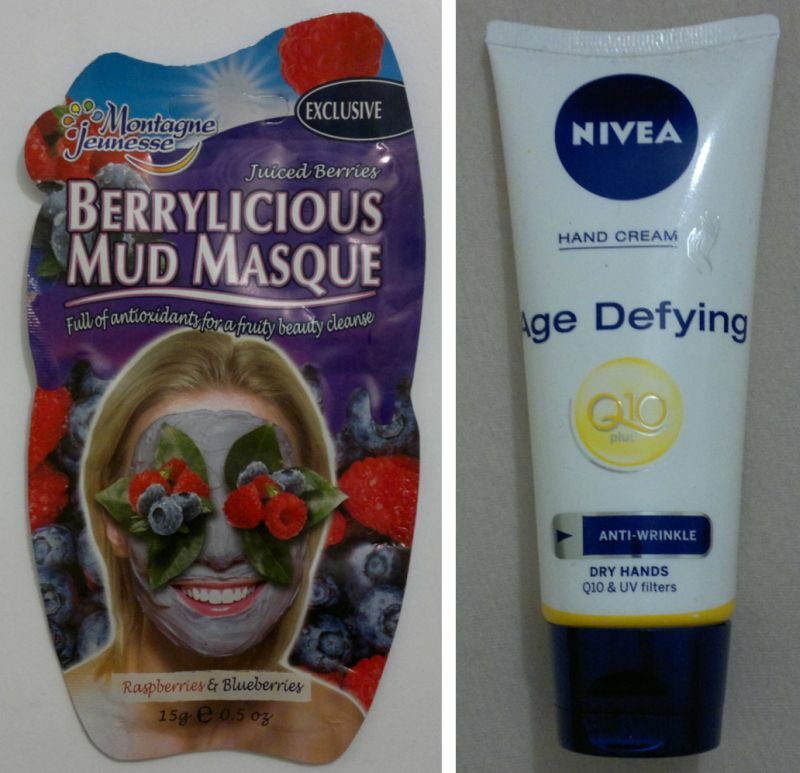 When I used Montagne Jeunesse’s Berrylicious Mud Masque for the first time, I liked it a lot. Then I used it again, and I started to love it! This mask is one of the best masks I’ve tried in the past 12 months. Awesome stuff! Nivea’s Age Defying Q10 Hand Cream is a great product. This hand cream does everything you’d expect from a hand cream. But it also smells extremely nice, and it has sunscreen! Just fantastic! 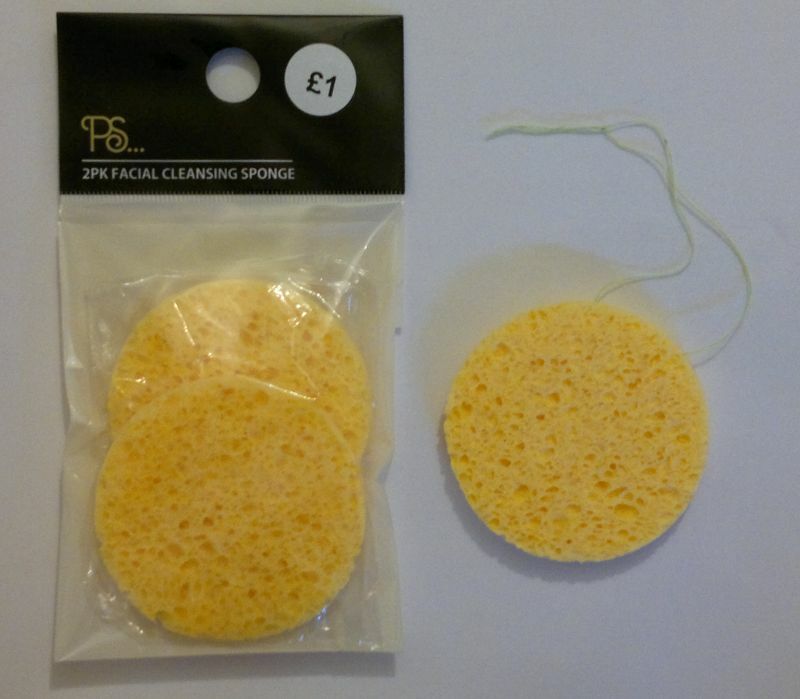 Primark’s PS… Cellulose Facial Cleansing Sponges are my new go-to facial cleansing tools. Beauty and skin care trends come and go, but I think these sponges might become all-time favourites, so I’ve already stocked up on these wonderful (and sensationally cheap) sponges. You really, really need to try these amazing beauty tools! Now onto the honourable mentions! I really liked I Love…’s Tropical Paradise and Mango & Papaya body care products. Superdrug’s Vitamin C Boost Body Butter, Superdrug’s Manuka Honey Peel-Off face mask, and Gliss’ Satin Relax hair products were very nice too! Have you tried any of these products? If so, how do / did you like them? Which products did you like best this month? Feel free to get in touch via the comments. And thanks for stopping by! Hi there! 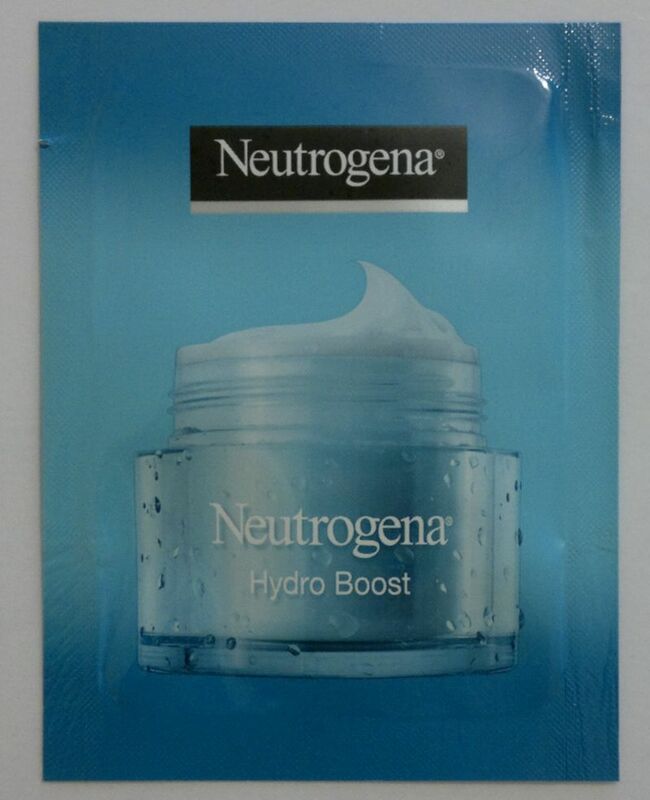 Not too long ago I received a Neutrogena Hydro Boost Water Gel sample. Hydro Boost is a new range that promises (I’m quoting from their marketing leaflet…) “Lightweight yet intense hydration for skin so supple it bounces back”. Neutrogena mentions hyaluronic acid, glycerin and an olive derivative as active ingredients which are supposed to hydrate skin and to (here’s another quote) “help fortify the skin barrier”. Sounds great. Now, how’s the water gel? I’m not impressed. I think that the water gel felt nice for the first few minutes, but it made my skin feel in need of hydration after less than an hour. I tried to wait and see what would happen, but after 2 hours I gave up. I didn’t want my skin to feel dry, so I just applied some Olay moisturiser on top of the water gel, and this seemed to help. Whilst I was expecting Neutrogena’s Hydro Boost Water Gel to be a moisture bomb, it turned out to be the exact opposite. In terms of hydration, I think this water gel is just as disappointing as Garnier’s Skin Active Moisture Bomb Tissue Mask and Superdrug’s Naturally Radiant Brightening Radiance Balm. Hi there! Today’s post is about Superdrug’s White Chocolate Mousse Mask. This face mask for normal to dry skin promises to cleanse and to nourish skin. So is this 99p mask any good? This face mask seems to be the reincarnation of Superdrug’s Yoghurt Smoothie mask. It looks, feels and smells the same. So yes, this mask cleanses my skin well, and it doesn’t leave my skin feeling dry. I would recommend it! 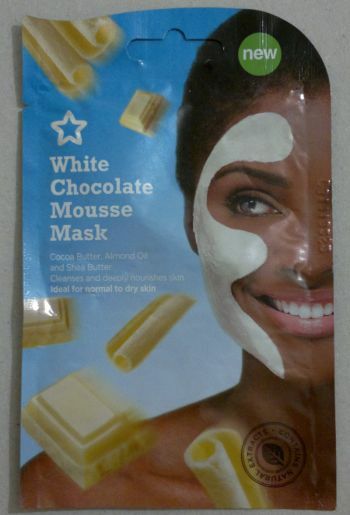 Superdrug’s White Chocolate Mousse Mask carries the Leaping Bunny logo. This means it’s BUAV-approved, so it’s 100% cruelty-free! Have you tried this face mask If so, how did you like it? Feel free to get in touch. And thanks for stopping by! Hi there! Today’s post is about another mani I did for the 31 Days Nail Art Challenge. And this mani is for challenge #28 Inspired By A Flag. I didn’t have any stamping plates with large maple leaf images, and I couldn’t draw a maple leaf if my life depended on it. So I opted for a stamping image that featured small maple leaves. Which products did I use? I chose Boots No 7 Devil’s Delight as my red base colour. The white nail polish I used for the accent nail is MUA White Wash. The red stamping colour is Rimmel 60 Seconds 320 Red Ruby, and the stamping plate is an unbranded one that’s just called CF-17. I really like how this mani turned out! One of the maple leaves didn’t stamp perfectly, but all in all I’m happy with this mani. How do you like this mani? 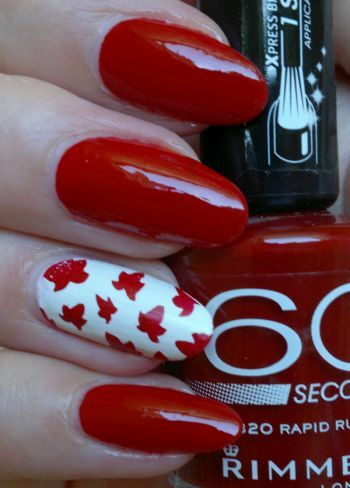 And if you’re Canadian – will you try a Canada Day mani? Feel free to get in touch via the comments. And thanks for reading! Hi there! 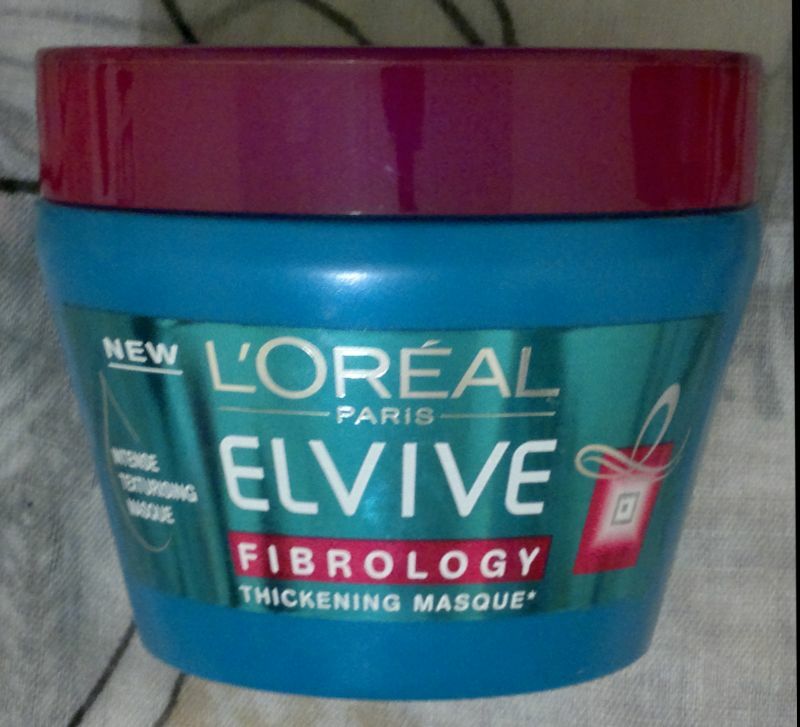 Today’s post is about a product that I’ve been using once a week since early May – L’Oréal’s Fibrology Thickening Masque. This product promises to expand hair from within, thus increasing the diameter of every single hair. L’Oréal also says that the thickening effect is long-lasting and buildable. This sounds fantastic! But does it work? If you read on, I’ll let you know. This mask is easy to use. It’s supposed to be used instead of a regular conditioner – you just need to leave it on for 2 to 3 minutes before rinsing it out. I’ve used this mask several times, but I’m not impressed because this mask feels like ‘product’ in my hair even after it’s rinsed out. I also don’t see or feel any immediate thickening effect. The only thing I can feel right away is that, as soon as my hair is blow-dried, it feels crunchy. But whilst there’s no immediate thickening effect, there is, without doubt, a delayed thickening effect which seems to kick in after about 18 to 24 hours. Unfortunately I can’t appreciate the delayed thickening effect because I wash my hair every day, so I won’t benefit from products which (claim to) start working after 24 hours. I will continue to use this hair mask because I can hardly give it away now, and I don’t want to be wasteful, so I won’t throw it away. Maybe I should treat my husband to a thickening hair mask every now and then! 😀 L’Oréal’s Fibrology Thickening Masque is available as 300ml for £5.09. I paid £2.49 (better than half price offer). 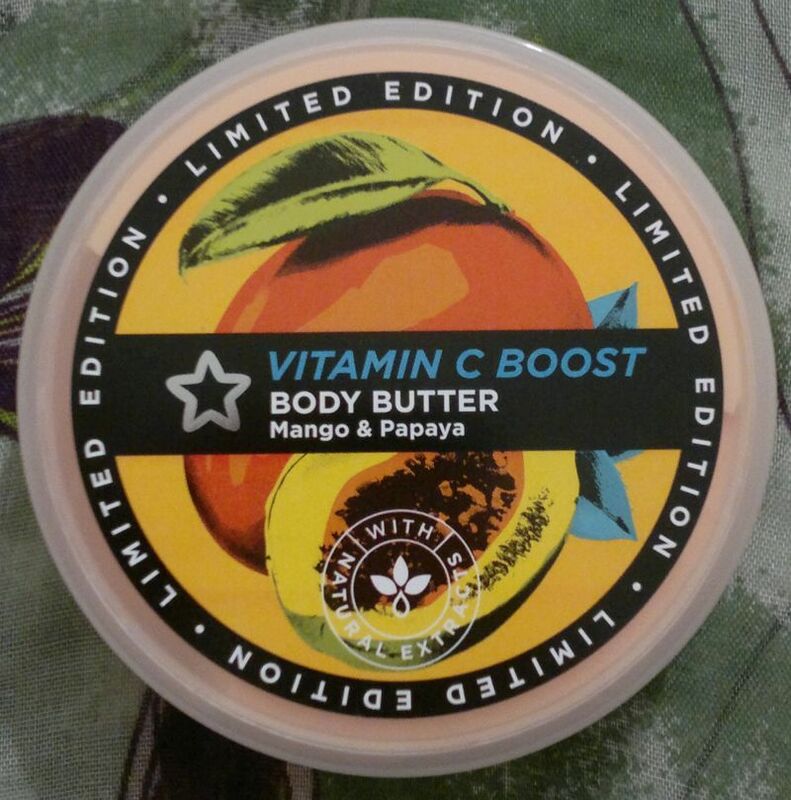 On Monday I reviewed Superdrug’s Mango & Papaya Body Butter. Click here to read the post. 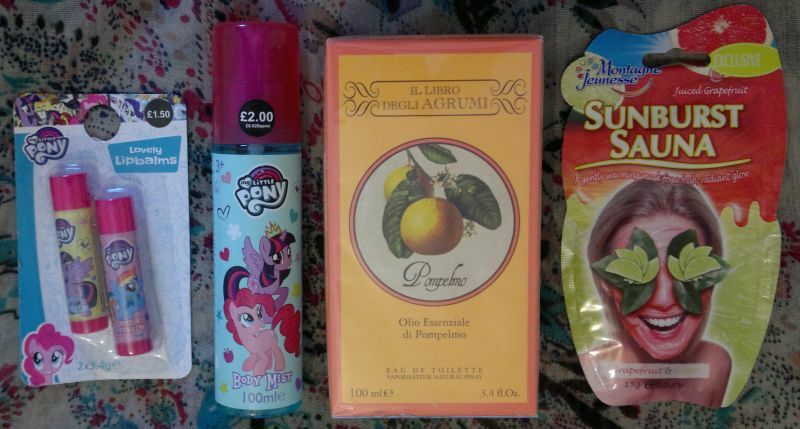 Tuesday 20 Jun – Haul! Tuesday’s post was about all the new products I bought recently. Click here to read the post. Wednesday post was a Nail Of The Day post. Click here to read the post. 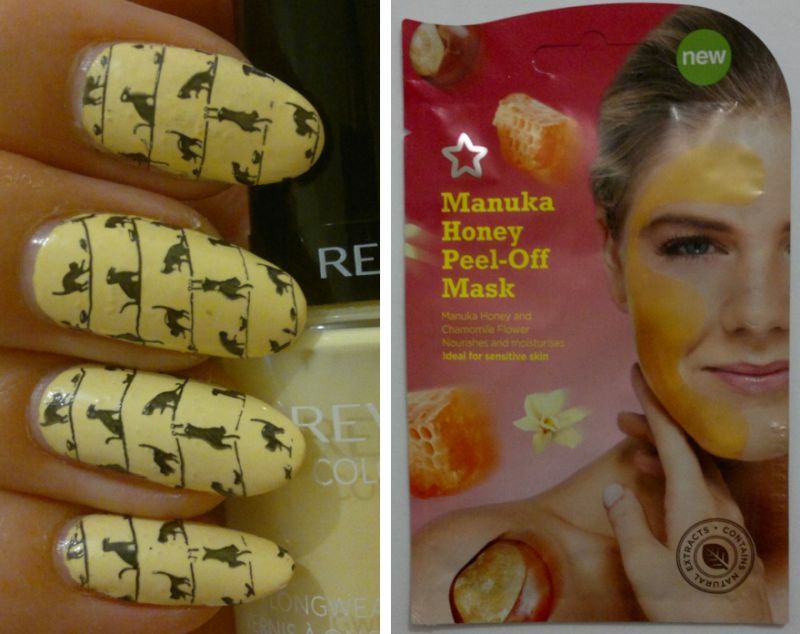 And on Thursday I reviewed Superdrug’s Manuka Honey Peel-Off Mask. Click here to read the post. 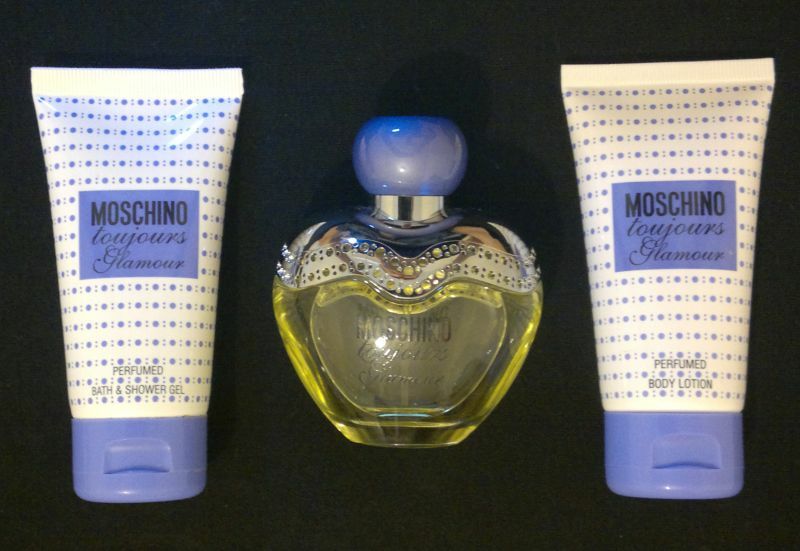 Friday’s post was about Moschino’s Toujours Glamour EdT, shower gel and body lotion. Click here to read the post.